Flamingo is the first brand to emerge from Harry's Labs, an offshoot of the company that has chipped away at the market share of industry giant Gillette, capitalizing on consumer frustration with pricey razors. NEW YORK (AP) — Harry’s has carved out a niche selling men shaving razors direct to their doors, elbowing in on an industry long dominated by names like Gillette and Schick. So its logical next step is Flamingo, a direct-to-consumer hair removal and body-care brand for women that launches Tuesday. Flamingo’s leaders say their aim is to make women more comfortable talking about shaving and waxing. “We want to normalize the fact that women might have hair here, or there, and if they choose to remove it, we want to support that,” Allie Melnick, the general manager for Flamingo says in an interview with The Associated Press. Flamingo is the first brand to emerge from Harry’s Labs, an offshoot of the company that has chipped away at the market share of industry giant Gillette, capitalizing on consumer frustration with pricey razors. Harry’s received $112 million in new funding earlier this year to develop new brands, with a vision to becoming a major consumer-products company to compete with the likes of Gillette parent Proctor & Gamble. Flamingo offers a five-blade razor, waxing kits, shaving gel and body lotion for women. The products will be sold on its own direct-to-consumer website , a space where the brand’s leaders Brittania Boey and Melnick hope to open frank conversations about women and body hair. The duo says Harry’s internal research shows nearly all U.S. women choose to shave or wax off some of their body hair. They say Flamingo wants to offer products and tips to help women do that while talking openly about furry toes, back hair and fuzzy upper lips. Harry’s launched as a direct-to-consumer company in 2013. It has since expanded into body care for men and now sells its products in Target and Walmart. Along with rival Dollar Shave Club, the company shook up the $2.8 billion U.S. men’s shaving industry, forcing Gillette to slash its razor prices and revamp its marketing strategy to stem a decline in market share. Harry’s remains a relatively small player, with 2 percent of the market, according to Euromonitor International market research firm. But its direct-to-consumer model has helped create a sense of intimacy with its customer base that bigger brands find hard to replicate. Consumers have a growing appetite for tailored offerings that make small companies appealing, according to a recent report from management consulting firm Bain & Co., which cited both Harry’s and Dollar Shave Clubs as examples. Chobani’s and Noosa’s have similarly disrupted the yogurt industry, while digital upstarts like Casper’s helped drive Mattress Firm into bankruptcy. 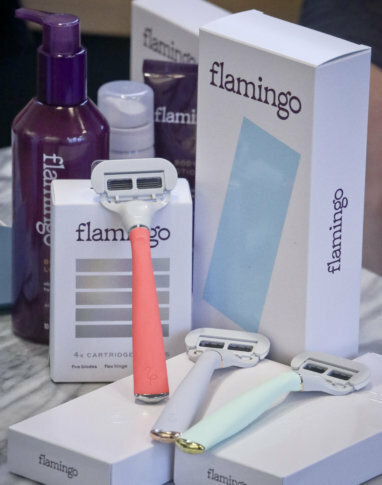 Flamingo hopes for the same success in the $1 billion U.S. women’s shaving industry, where Gillette holds 50 percent of the market, according to Euromonitor. The new brand will compete in a more fractured landscape than the one Harry’s encountered for men’s shavers five years ago. Among them are Angel Shave Club, which donates part of its sales to the Malala Fund to promote education for girls abroad. The start-up Billie made a splash since launching last year with ads showing body hair _ including a gif of a woman shaving her toe _ while declaring war on the “pink tax,” the notion that women typically pay more than men for the same product. “It is likely that more women’s shave clubs will enter the U.S. market before one or two players emerge on top,” Kayla Villena, senior analyst at Euromonitor International, said in a recent report that preceded Flamingo’s launch. Melnick and Boey said more than 1 million women have bought Harry’s products, making Flamingo a logical first choice for the company’s newest brand. “My wife uses Harry’s now, too. She was stealing mine, so I got her one,” said Cody Chastain, a 42-year-old Roseville, California, man who likes Harry’s because of the convenience of its delivery service. Flamingo mirrors Harry’s in pricing and the simplicity of its offerings. It has one five-blade razor with a handle that comes in three different colors, priced at $9. Cartridge replacements are $2.25 per blade. It’s a deliberate contrast to the array of women’s razors from Gillette and No. 2 player Schick, which range from disposable razors for around $1 a piece to higher-end razors at $4 or $5 per blade replacement. One notable difference separates Flamingo from the men’s razors Harry’s offers. Flamingo will offer its products a-la-carte only because women’s shaving routines vary too widely for subscription plans, Melnick says. Some shave only during warm seasons. Other might not bother shaving their legs if they are not in a romantic relationship. And, she says, women are very particular about which part of their body to shave or wax.